As the old slogan goes...the state creates the violence which it uses to justify its existence. Sometimes the state, in the form of the police, get photographed justifying their existence, though Section 76 of the CTA allows the police to criminalize photographers in certain, but by no means arbitrary cases. At the Financial Fools Day protests, people were being intimidated into deleting photographs of the members of the police force 'going about their duty'. Some footage has consequently surfaced of the police going about their business on a man who later died. The IPCC actually went round to a newspaper to have the footage taken off a website, citing the idea that it might prejudice the inquiry. 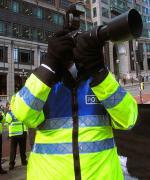 For my part, I have been going round doing a bit of liasing with the police at various protests to highlight the pernicious laws surrounding the chipping away of cilvil liberties regarding the citizens right to photograph the police and armed services in action. 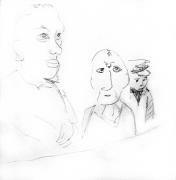 I go around armed with my recording device - a pencil and pad - on the outside of the dubious 'kettles' set up, doing a bit of life drawing of the police officers, still-life in their lines, and have a chat with them about the CTA, police tactics, and particular qualities of their face.